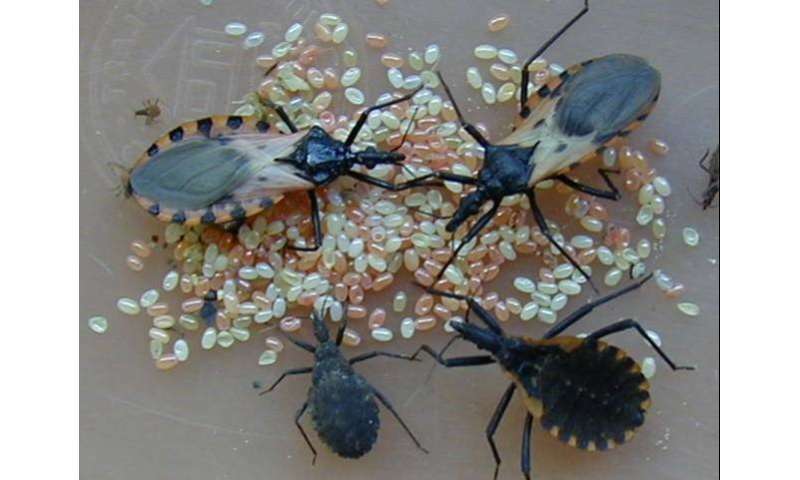 In Central America, Chagas disease, or American trypanosomiasis, is spread by the "kissing bug" Triatoma dimidiata. By collecting DNA from the guts of these bugs, researchers reporting in PLOS Neglected Tropical Diseases have described patterns in the behavior of the bugs, the strain of parasite, and the communities of microbes that interact with the parasite. Chagas disease is caused by the protozoan parasite Trypanosome cruzi and can cause both acute and chronic infections in humans, who most often catch the disease from the bits of infected T. dimidiata. A better understanding is needed of the complex interactions between the human host, the T. cruzi parasite, the T. dimidiata vector, and other microbes that reside in the guts of the vector. In the new work, Sara Helms Cahan, of the University of Vermont, USA, and colleagues studied 61 adult T. dimidiata which had been previously collected throughout Central America from 1999 through 2013. The researchers isolated DNA from the abdomens or legs of each preserved specimen and sequenced the genetic material, which represented a mixture of T. dimidiata DNA as well as DNA from any vertebrate blood meals and any microbes residing in the guts of the insects. Using the DNA from the T. dimidiata legs, the researchers assembled a reference genome for the bugs. Then, they were able to study the DNA from the guts that didn't match the vectors. They identified vertebrate blood meals including chicken, dog, duck and human, and two strains of T. cruzi. Additionally, they found that infected T. dimidiata had a higher bacterial species richness in their abdomens compared to uninfected insects. "Overall, our results show that a mixed-DNA approach can provide simultaneous information on the community of biotic factors involved in T. cruzi transmission," the researchers say. "Testing this sequencing method with different vectors and disease models will help to determine its reproducibility in other systems where multiple organisms interact in tightly-integrated and complex ways."